"Old-time religion" has been and still is a uniquely potent force in shaping the imaginations of southern fiction writers. A little more than a generation ago, Flannery O'Connor made a startling observation about herself and her fellow southerners: "By and large, " she said, "people in the South still conceive of humanity in theological terms. While the South is hardly Christ-centered, it is most certainly Christ-haunted. The Southerner who isn't convinced of it is very much afraid that he may have been formed in the image and likeness of God." Still earlier in the century H. L. Mencken wrote that the South consisted of a "cesspool of Baptists, a miasma of Methodists, snake charmers, phony real estate operators, and syphillitic evangelists." This book explores the roles that various strands of southern religion, most prominently Evangelical Protestantism (both black and white) and Catholicism, have played in shaping contemporary southern fiction. 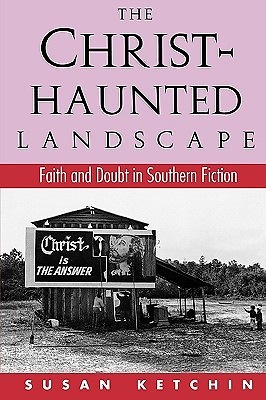 The Christ-Haunted Landscape collects works by twelve southerners living and working in the South - Larry Brown, Reynolds Price, Allan Gurganus, Lee Smith, Clyde Edgerton, Harry Crews, Will Campbell, Doris Betts, Sheila Bosworth, Mary Ward Brown, Randall Kenan, and Sandra Hollin blowers. Susan Ketchin has included a descriptive profile and an original interview with each author, critical commentaries on each author's works as a whole, and representative fiction (short story or excerpt from a novel). Her introduction discusses the religious and cultural forces that have impact on today's imaginative writers whose fiction is enhanced by the legacy of Faulkner, O'Connor, and Percy.